Motto: "Together we aspire, together we achieve"
The Republic of Trinidad and Tobago is a nation in the south Caribbean Sea. It is 11 km (7 miles) away from Venezuela. 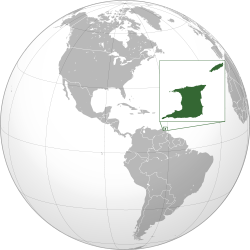 The country has two bigger islands, Trinidad and Tobago, and many smaller islands. The capital is Port-of-Spain. The country has about 1,262,366 people in it. 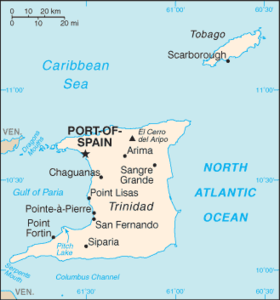 Trinidad and Tobago received independence from the United Kingdom on August 31, 1962. Before that, it was ruled by the U.K. Right now, the head of state (person who is in charge of the country) is President George Maxwell Richards. The head of government (person who is in charge of the government) is Prime Minister Kamla Persad-Bissessar. Trinidad and Tobago is very diverse. It has people of many different races and religions. There are people who are children of Africans, Europeans, Arabs, Indians, and Chinese who moved to the islands a long time ago. The biggest religions in the country are Christianity and Hinduism. There are also Islam and African religions in the country. The country has some natural gas beneath the ground and underwater in the ocean. Natural gas is a liquid that makes machines work and heats houses. Also, many people called tourists visit the islands. They take pictures and learn about the islands. The people in the country are famous for their music. They also play football and cricket. ↑ 2.0 2.1 2.2 2.3 "Trinidad and Tobago". International Monetary Fund. http://www.imf.org/external/pubs/ft/weo/2010/01/weodata/weorept.aspx?sy=2007&ey=2010&scsm=1&ssd=1&sort=country&ds=.&br=1&c=369&s=NGDPD%2CNGDPDPC%2CPPPGDP%2CPPPPC%2CLP&grp=0&a=&pr.x=79&pr.y=6. Retrieved 2011-02-18. This page was last changed on 2 December 2013, at 18:30.